Seven Quick Takes Friday is hosted at Conversion Diary. From the WordPress.com blog: You spend a lot of time creating great content and attracting an audience for your blog. What if you could use that influence to make a positive social impact? Now you can. We’ve teamed up with SocialVibe, and now by adding the SocialVibe widget to your blog, you are able to earn donations for the charity of your choice by getting sponsored by a brand that appeals to you. I’m not exactly sure how this works yet, I’m still researching it, but I like the overall concept. Personally, I really dig blogging for charities – blogging is such a self-indulgent activity that it’s nice to be able to give a little of myself, of my life experiences, back to the community in some small way. However, when I looked over the list of charities that are currently participating in Social Vibe, I was disturbed to see that PETA currently has WAY more donations than say, charities geared toward children. (Sorry this is so pixelated). The fact that people put way more thought, energy and effort into saving animals – that were created and put on this earth for man, I might add – instead of investing in our future, which is our children for the confused, really says a lot about our sad and twisted society as a whole. Placing more value on animals instead of on children angers and disgusts me on so many levels. The 2009 Blog-a-thon begins July 25th! The blog-a-thon, in a nutshell, is blogging 24 straight hours for a charity. Bloggers provide both entertainment and information in articles posted every 30 minutes for 24 hours to try and entice readers to donate money and/or time to their showcased charity. I’ve participated in the blog-a-thon for the past two years – in ’07 I was part of the Write Anything (back then it was called Write Stuff) ‘thon and last year, I did the ‘thon all on my own because the blog-a-thon site wasn’t participating last year. I plan on continuing the tradition year after year, with or without the official blog-a-thon website because I think it’s important to bring attention to, and remind people, that giving back to the community is important. We all get so wrapped up in our lives and stingy with our time, that I think it’s crucial to stop the craziness and donate our time and talents to those that truly need it. I’m also pretty passionate about donating time and attention to local charities – both in our communities and in our country, in general. Sure, it’s great to go overseas and help those in third world countries and it’s honorable to financially give to these worthy charities, but I think it’s EQUALLY important to turn our attention to those in need on our own soil, too. If you’re participating in the ‘thon, please leave a comment so we can keep each other awake! I can use all the support I can get. I haven’t decided on which charity to support yet – I’m seriously thinking of doing something a little different (I know, big shocker there) and actually talk about ALL of the charities in my community just to raise awareness. Let the blog wars commence. *sigh* Seriously. Why do we feel compelled to put each other down, or step on each other in order to try and make ourselves more important in this self-imposed blog-o-sphere hierarchy? I honestly don’t understand the b*tchy posts that have cropped up in the last week or so. It’s a blogging conference, folks. It’s not the academy awards. No one is going to remember, or care, when this thing is over. You might be a celebrity for a day. You’ll still have to go back to your regular life after it’s over and guess what? The sphere is a vast and dare I say empty place to live. It’s big enough for all of us. We all have different and unique voices. We all have different reasons for doing what we’re doing. We have different ways of doing what we’re doing. The trick is to find those bloggers we care to be around. If you don’t like someone, or like what someone is doing, place your index finger over your mouse button and *gasp* click away. I personally have no interest in turning my blog into anything other than it is – a place to dump my boring, mundane thoughts. I’m not interested in SEO rankings. I’m not into placing ads in my sidebar. I could care less about accepting products to review. This is what I feel and who I am. Because of this, I will never attend a blogging conference like BlogHer because it doesn’t offer anything that I want. If there is ever any sort of organization where the sole purpose is to get together and meet each other, without all of this added pressure of trying to make more money or be better in Google rankings than my blogging peers, then I’ll be the first one to sign up. But as it stands now? No thanks. If you go, great. I hope your expectations are met. If you don’t, then leave the ones who choose to go alone. We’re all supposed to be adults here, let’s act like adults. And for those going to BlogHer? Have fun! We’ll see you when you get back. I’d like to take a moment to share this awesome button that Dale made over at Write Anything. Please feel free to steal this button and put it on your blog/website. Please link the button to this URL: http://writeanything.wordpress.com. Oh, and if you’re looking to stretch your creative writing muscles, then check out today’s [Fiction] Friday prompt. There’s quite a community going on over there. Check it out when you have a few minutes! It’s called “Print Friendly” and in essence, it turns your blog posts into a PDF file. What’s cool about this is that you can delete any portions of the post you want to before printing so you don’t end up with a page full of ads or anything else cluttering up the content. You can see an example of how it works by clicking on the green “print friendly” button at the end of this post and then typing in http://writefromkaren.com in the URL space. Pretty cool tool. I don’t know when you would ever WANT to print off a blog post, but I’ve had some people say that they wanted to print off a few of my articles before so … you never know. The point is, it’s AN OPTION – it’s there if you ever need it. You access it by clicking on the “Blog This” feature in Flickr. If you’re not a Flickr user, then that probably doesn’t make sense to you, but I’ve set it up and tested it and it works great. 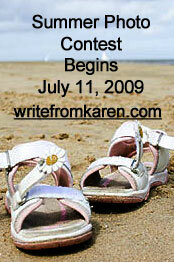 And by the way, if you want to follow me on Twitter, you can find me here: http://twitter.com/writefromkaren. I’m ALWAYS on and ALWAYS updating so follow me and let’s chat! Every Wednesday, Nicki, from Birthplace of the Process of Illogical Logic, posts Humpday Hilarities. She passes on jokes she’s received from friends and family and they never fail to make me laugh. A married couple were asleep when the phone rang at 2 in the morning. The wife (undoubtedly blonde) picked up the phone, listened a moment and said, ‘How should I know, that’s 200 miles from here!’ and hung up. ROFL!! Love this one! It’s a prime example of how we take everything soooo seriously. Anyway, I hope your Friday is going well. More vacation pictures will be posted tomorrow! The button looks awesome for Write Anything, as does the [Fiction] Friday graphic. Been enjoying the community over at WA lately.